Choosing the right fifth wheel for your RVing needs can be an intimidating task, and a decision that could take you quite some time to make. But there’s no need to delay your RVing adventures. We have many different fifth wheels for sale in our inventory, and we can help you determine which one is right for you. Let’s take a look at and compare different fifth wheels floor plans, so that you can be better informed in knowing exactly what you need. This Keystone RV at 36 feet has two slides and sleeps up to nine. A private bunkhouse, tri-fold sleeper sofa, and separate residential bedroom with Queen mattress comfortably house family members, children, or guests without feeling overly cramped or crowded. Additionally, a bath and a half as well as two entries/exits afford you both privacy and convenience for both early and late risers. Finally, you can free up your interior space by utilizing the exterior pull out kitchen, complete with mini fridge and cooktop burners to prepare meals when the weather is beautiful. Explore our Keystone Hideout RVs for sale or other Keystone RV fifth wheels for sale and the different floorplans within this line of models! Now consider the Coachmen RV. This fifth wheel comes in at 35 feet and has three slides, also sleeping up to nine people. The living and dining area includes a fireplace, LED TV, dinette, and tri-fold sofa. The full size kitchen runs along the curb side wall slide out and you will not lack for room while preparing meals! A full kitchen island is available with sink cover gives you extra counter space. Because the rear bunk house utilizes two slides, your children (and their friends!) will have plenty of room to call their own, and a full bath separates the living area from the residential bedroom. You’ll love the spacious storage cabinets in both bedrooms, bathroom, and kitchen. 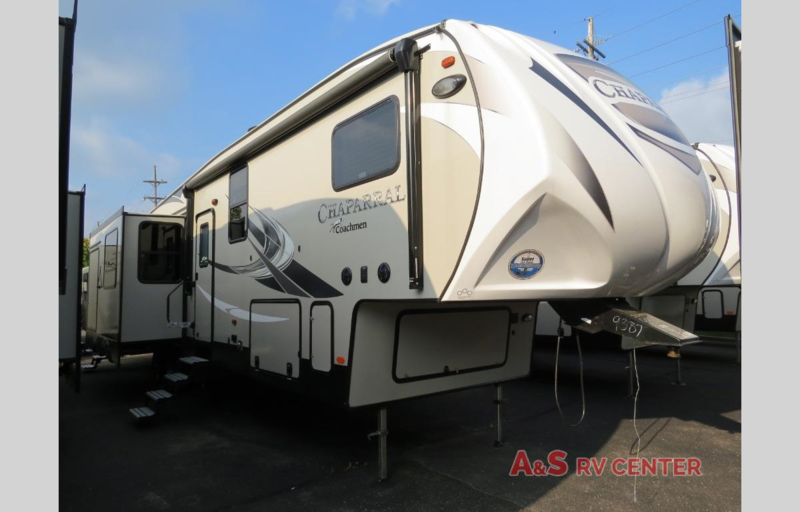 The exterior of the Coachmen Chaparral Lite is ready to haul the extras, with spacious storage compartments, fold down bike rack, and exterior camp kitchen. If you love camping with your family and having room to spread out, this is the RV for you! 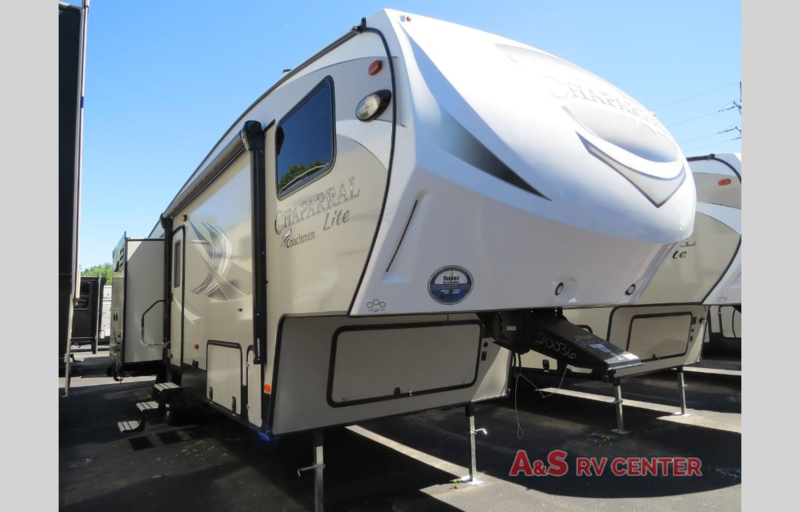 Check out our Coachmen RV fifth wheels for sale here and the different options you can choose from in the Chaparral Lite floor plans! Finally, take a look at the Forest River RV. This deluxe fifth wheel hauls in at 42 feet, has five slides, two private bedrooms, and two full baths. This RV has everything you want in space, convenience, and luxury! The primary bedroom features a residential Queen memory foam bed, spacious storage, and mirrored cabinet doors. It is connected to a full bath with radial shower, vanity, and lovely hardware fixtures. The second private bedroom includes double slide-out bunks, which is perfect for traveling with friends or children. And the combined living and kitchen area also includes a tri-fold slide out sofa, theater seating, plus a free standing dinette. A second full bath at the rear end of the RV gives everyone extra convenience, and conscientious overhead storage cabinets throughout the entire model give you the space and comfort you want whether you are on a short vacation or an extended trip. This is absolutely a premium RV with space for everyone and everything they pack! 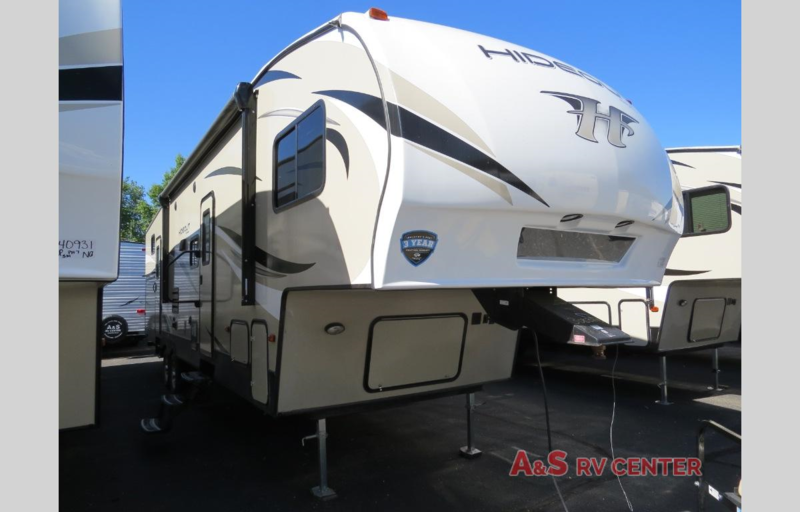 If you’d like to compare or look at other Forest River RV fifth wheels for sale, or find out more about this particular Forest River RV Chaparral 373MBRB, we’d love to help you out! We know everyone has different needs while traveling, and we’re certain we have a fifth wheel that is just right for you. Contact us today if you’re ready to take a look at these or other models!